Have you ever thought of putting cottage cheese in a smoothie?? Trust me, it's delicious! Protein, calcium, veggies, and fruit - all in a tasty smoothie! Cottage cheese is high in protein, low in carbohydrate and lends a creamy, almost cheesecake-like taste to smoothies. It doesn’t leave a "tangy" taste that you often get with yogurt. For this smoothie you can use whichever liquid you prefer: soy milk, cow’s milk, or nut milk such as almond or cashew. All together with a touch of cinnamon = a yummy smoothie! Cinnamon is a spice that pairs well with almost all fruits. Containing antioxidant and antimicrobial properties, cinnamon has been associated with a number of health benefits including increased insulin sensitivity and blood pressure control. Adding spinach boosts the nutritional content even higher and for those of us who don’t like green drinks (me! ), you won’t even notice the spinach in there! 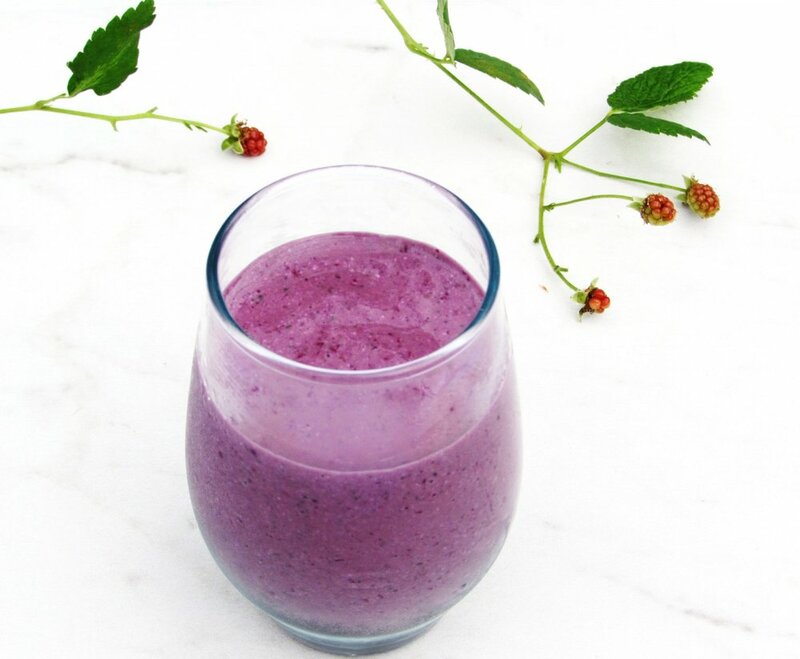 I used frozen blackberries in this smoothie but any frozen fruit would work well (although the deep colored fruits will help "disguise" the spinach if needed!). Tip: stock up on frozen fruit when it is on sale to keep on hand specifically for smoothies, or "flash-freeze" washed fresh fruit (spread on sheet pan, freeze and store in freezer bags). Blend all ingredients in a blender on high speed until smooth. Divide between two glasses and serve immediately.